Though it's late in the year, there are still impressive meteor showers to see before the calendar flips over to 2018. This week, you can catch the Orionids. Though the display is active from October 2 through November 7, it is expected to peak the night of October 21 into the morning of October 22, Bill Cooke, who leads NASA’s Meteoroid Environment Office, tells Thrillist. The best of it can be seen before down the morning of the 21st and around 3am the morning of the 22nd. The Orionids have the fastest meteors of any shower, save November's Leonids. The meteors move at about 41 miles per second, says Cooke. "The Orionids, because they're moving so fast, they burn up very quickly," he said. "In other words, you blink, you're going to miss them." He also notes that part of what makes them special is that the meteors are bits from Halley's Comet. It's one of two meteor showers created by the universe's most famous comet, which isn't due for another trip past Earth until 2061. The Orionids work on a 12-year cycle. At its peak, the meteor shower produces from 80 to 90 meteors per hour. At its lowest point, it produces 10 to 15. Right now, we're moving toward higher numbers, but this year's display is likely to produce around 20 meteors per hour. It's not as exciting as the 120 an hour the Geminids will produce in December, but viewing conditions for the Orionids should be excellent. There's a new moon just two days prior to the peak, so a slight crescent moon will set before midnight, providing a nice clear view for stargazers. To watch the display, look for the constellation Orion, with its belt of three stars, in the eastern sky. The meteors can appear anywhere in the sky but will emanate from just above the belt with a red supergiant star called Betelgeuse. 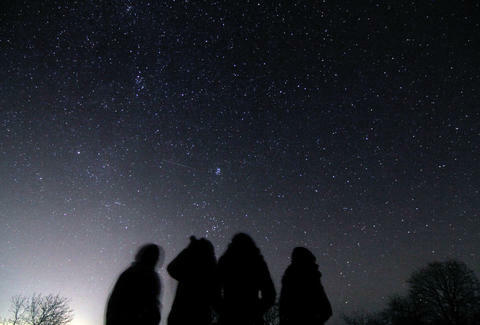 To get the best meteor-viewing experience, get away from city lights. You'll see the most meteors if you're looking up into a dark, cloudless sky. (Use this map to find the dark sky nearest you.) Get to your spot a little while before the peak to give your eyes time to adjust. (And try not to stare at your phone, which doesn't help the adjustment.) You don't need a telescope or other device. You want to have as broad a field of view as possible, so looking with the naked eye is great. The best time that night is going to be around 3 am local time. That's when the Orionids will be putting on its best show. If you're feeling lazy, you can stream the shower live at Slooh. But you should try not to be lazy, even if it (maybe) means you're super smart. Dustin Nelson is a News Writer with Thrillist. He'll be out there. Follow him @dlukenelson.